A paring knife is a smaller version of a chef’s knife and is known for its small and thin blade. It is a tool that should be found in every kitchen since it is specially designed for coring, mincing, peeling, and slicing small food items such as garlic, herbs, and small fruits and vegetables. If you’re interested in buying one, we took a look at different paring knives to find which one of them is the best paring knife you can get for your kitchen. We have searched the market and found three paring knives that were manufactured by companies that have been around for years. We have looked into each of their key features, as well as benefits and drawbacks. Zelite Infinity is a family business that strives to innovate their products and provide their customers with some of the best knives. This paring knife is part of their Alpha Royal Series and has an aesthetically pleasing look. 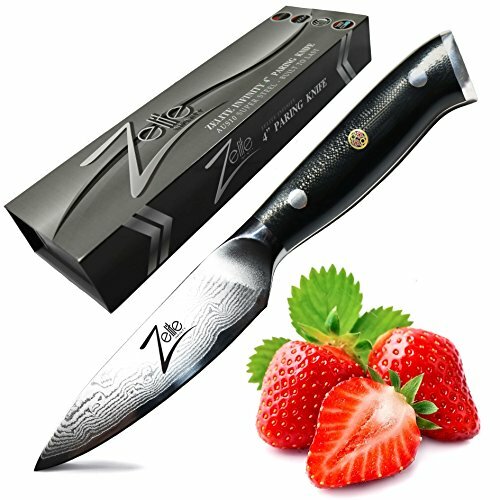 The straight spine blade of the Zelite Infinity Four-Inch Paring Knife is made of 67 layers of stainless steel that has high carbon content. It was made by forging high-quality metal into 33 layers with the traditional three-stage Honbazuke method. This can be seen through the “Tsunami Rose Damascus” pattern on the blade. The full tang blade is further tempered with liquid nitrogen to ensure long-lasting sharpness. It has a 12- to 15-degree razor sharp edge, and its spear point is non-stick. Additionally, it is rated as Japanese AUS10 with a Rockwell hardness of 61 for edge retention. On the other hand, the handle has an ergonomic design and is finished with a non-slip, black military-grade G10. It features the classic three-metal mosaic rivet with the middle rivet having the three-metal logo of Zelite Infinity. The handle’s shape is rounded for a natural grip and a secure and comfortable feel. It is also resistant to moisture, heat, and impact. Likewise, it is made to be seamless and smooth to ensure that no food particles or germs get trapped. Overall, the paring knife measures 7.9 inches in length, 0.6 inches in width, and 0.5 inches in height. It weighs just around 2.08 ounces. Dalstrong is another company that aims to provide its customers with innovative products. They combine ancient craftsmanship and modern methods to achieve such. 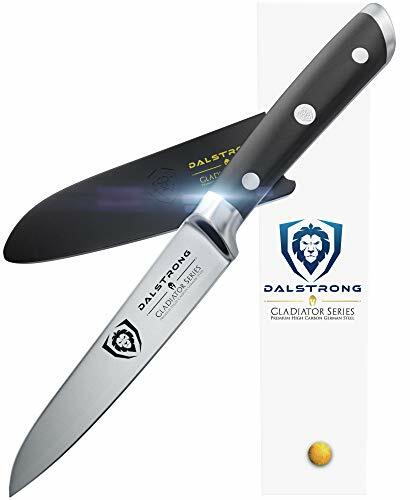 The Dalstrong 3.5-Inch Paring Knife is part of their Gladiator Series. The Dalstrong 3.5-Inch Paring Knife is a full-tang knife that is equipped with a ThyssenKrupp blade that resists stain and heat. The chromium-loaded blade is made of German steel that has high carbon content. It is engineered to be one of the best blades with 55 Rockwell hardness rating. The blade is also mirror polished, as well as ice tempered and heat treated to ensure longer sharpness. It is also carefully tapered for improved hardness, flexibility, and little slicing resistance. Having a satin finish, the blade has a 14 to 16 degrees edge on each side and has been hand-sharpened for superior quality. Its blade height is quite tall for a paring knife, so the user will have knuckle clearance when chopping food. Additionally, it has a BPA-free Dalstrong PerfectFit sheath or a finger protective bolster to provide the perfect balance and the right hefts for kitchen activities. The handle of the Dalstrong 3.5-Inch Paring Knife is made from imported black Pakkawood, and is laminated and polished for a sanitary build. It has a triple-riveted grip for great maneuverability and comfort while using the knife. The center rivet is engraved with the Dalstrong logo. The paring knife has a length of 3.5 inches, a width of 0.1 inches, and a height of 0.9 inches. Weight-wise, it comes in at approximately 3.68 ounces. Kuhn Rikon is a Switzerland-based company that has been innovating food preparation products since 1926. It has subsidiaries in the USA, Great Britain, and Spain. The Kuhn Rikon Colori Set of Three Paring Knife is one of its best-selling products. 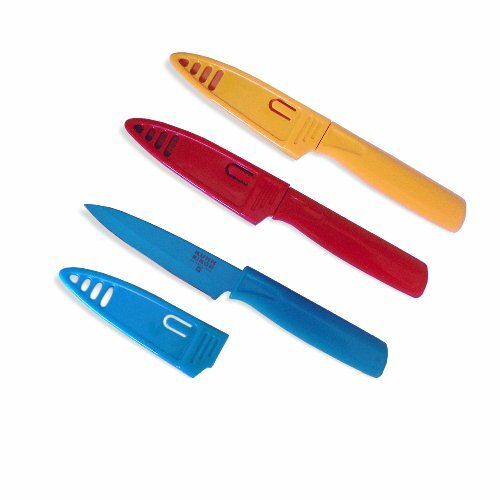 The Kuhn Rikon Colori Set of Three Paring Knife is composed of blue, red, and yellow knives, making it great for coordinating blades for different tasks and different kinds of food. For example, the blue for dry ingredients, yellow for meat, and red for chicken. However, if you are not inclined to colored knives, it is also offered in plain black. The blade of the knives included in the Kuhn Rikon Colori Set of Three Paring Knife is coated or finished with a non-stick material so that food slides off easily after slicing or chopping. It is made with high-carbon Japanese stainless steel and has been sharpened well. That being said, to ensure protection while not in use and keep the blade sharp, each knife comes with a color-matched sheath. On the other hand, the handle is crafted with plastic materials and has an ergonomic design and a balanced grip. Each paring knife has a width of 0.5 inches and a total length of 11 inches, while the blade comes in at 6.8 inches. The knives are dishwasher safe, but the company recommends that you handwash them. The three paring knives we have reviewed above were made to do their job in the kitchen. Their blades were crafted using high-carbon, quality steel and are constructed for razor-sharp cutting and slicing. Likewise, they are also made with a solid handle for three- or four-inch blades. 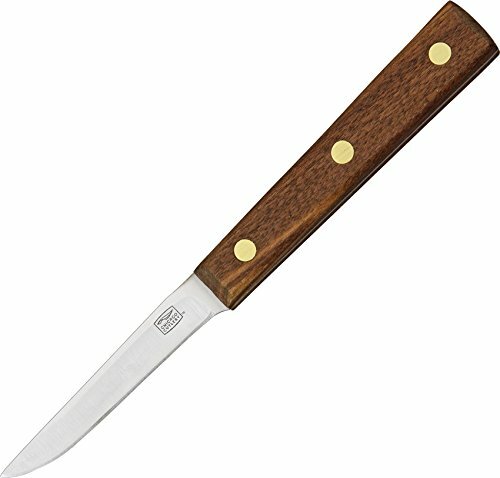 Although all the knives feature the best qualities of a good paring knife, namely being sharp, short, and lightweight, we would say that the best paring knife out all these three has to be the Dalstrong 3.5-Inch Paring Knife. The Dalstrong knife does not feature any fancy layering or patterns on the blade, and it does not have any colors or designs. However, the blade has undergone a lot of processes that make it sharper and more durable than the blades of the two products. Also, although this paring knife is moderately priced, the after-sales services provided by the company and the lifetime warranty tag make it a worthy investment. Contrary to some people’s belief, the kitchen should have more than two knives. This is because various food or ingredient require different types of cutting. For example, a bread knife cannot cut meat and vise-versa. Arguably, it takes time to find the different knives one needs for cooking various dishes. This is why many product makers are producing knife sets that contain the most widely used knives in the kitchen. And if you are on the lookout for one, then you may want to consider the Mercer Culinary Genesis 6-Piece Forged Knife Block Set. Mercer is a firm that specializes in the production of professional cutlery. They have been in the commercial market for three decades and currently claims to be the preferred supplier of culinary schools in North America. Aside from professional cutlery, Mercer also produces turners and serves, kitchen accessories and tools, plating tool, chef apparel, and allergen safety products. The Mercer Culinary Genesis 6-Piece Forged Knife Block Set promises to be a superior knife set with an elegant holder. The set includes an eight-inch chef, eight-inch bread, six-inch boning, five-inch utility, and a 3.5-inch paring knife. The knives are made from non-staining and high-carbon German steel that can resist corrosion, rust, and discoloration. These are forged knives that are fabricated from a single piece of steel that has been strengthened by heat. Each knife has a full tang design that runs throughout the handle for great balance and ease of use. They also have a taper-ground edge for more stability, long-lasting sharpness, and easy honing. The handles are made from ergonomic Santoprene with a non-slip grip. The material can also withstand exposure to kitchen oils and cold and hot temperature. The set boasts of a modernly designed holder. It has a glass see-through window design and is made from tempered glass. This allows users to find the knife they need. The knife set is NSF-certified. NSF is a provider of safety-based risk and public health management solution. This certification means that the product has met a high standard for quality, performance, and safety. The knives are not dishwasher-friendly. And the set comes with a limited lifetime warranty. The Mercer Culinary Genesis 6-Piece Forged Knife Block Set has many great features. For one, the blades are from high-carbon German steel that does not stain. They come in a full tang design for easy handling. The tapered ground edges also provide good stability. The handles are from Santoprene and are ergonomic. The set’s holder is of modern design with its tempered see-through glass, which allows users to find the knife they need quickly. The knives are certified for safety, performance, and quality by NSF. The sets product maker, Mercer also offers a limited lifetime warranty. However, this six-piece knife set is far from perfect. In fact, it suffers a variety of flaws. For one, the holder has metal edges, which some of the knives come in contact with. This often results in the dulling of the knife. Some of the knives also rust if left wet for some time. They are also not easy to clean since they have to be washed by hand. The Mercer Culinary Genesis 6-Piece Forged Knife Block Set has many competitors on the market. For example, the Cangshan TG Series 62311 Swedish Sandvik 12C27 Steel 6-Piece Knife Block Set is also a six-piece set. Like the product under review’s manufacturer, Cangshan is an award-winning maker of high-quality cutlery. It is known for combining the Eastern and Western style design for its products. It manufactures knives that suit the various levels of culinary creatives and professionals. 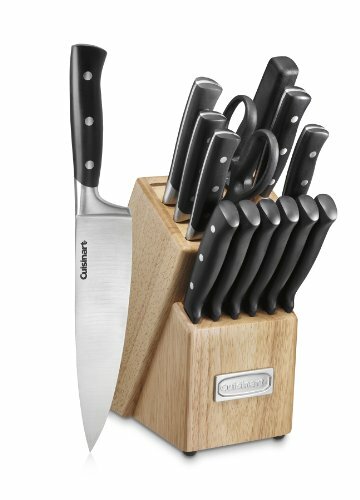 This knife set by Cangshan uses a Sweden Steel for its blades. This is different from Mercer’s high-carbon German steel. The Cangshan set includes an eight-inch chef, eight-inch bread, five-inch serrated utility and 3.5-inch paring knife. The set does not have a boning knife unlike the one by Mercer. Instead, Cangshan has the seven-inch santoku knife. Both products have the same full tang knife design. Cangshan’s knives, however, have a fiberglass handle complete with mosaic and star rivets. On the other hand, Mercer’s set has Santoprene as the material for the handles. The two products differ in the block holder as well. The Mercer knife set uses a see-through tempered glass while Cangshan has a dark solid walnut wood block for its holder. Both sets are NSF-certified. And their product makers offer a limited lifetime warranty. Mercer Culinary provides many compelling reasons to the Genesis 6-Piece Forged Knife Block Set. For one, it uses high-carbon and non-staining German steel. Each knife is well designed with the full-tang feature and tapered ground edge. The set’s holder is unique. There are, after all, very few knife sets that use tempered glass for the block holder. The set, however, has its flaws. For one, the unique design of the holder can leave some of the knives dull. The knives are also not easy to clean as they need to be washed by hands. It also does not help that there are reported cases of the blades rusting easily. So, are the features Mercer Culinary Genesis 6-Piece Forged Knife Block Set enough to outweigh its flaws? Fortunately, this Mercer knife set is highly comparable to the performance and design of some of the products from reputable cutlery makers. For example, the TG Series 62311 Swedish Sandvik 12C27 Steel 6-Piece Knife Block Set is manufactured by the award-winning cutlery maker, Cangshan. And the two share some virtues. The most important of which is that the blades do not become dull quickly. Both sets are also NSF-certified and come with a lifetime warranty. Overall, the Mercer Culinary Genesis 6-Piece Forged Knife Block Set is a good buy and could last long if used and cared for properly. It takes time and a lot of money to complete all the kitchen essentials. After all, cooking requires many appliances and wares. Some items needed by the cook come in different design and function. Take for example the knives. They come in different kinds, function, and designs. Unfortunately, having just a knife or two in the kitchen will make it difficult for any cook to slice various food. It is best then to invest in a knife set that would have the basic tools needed for cutting. 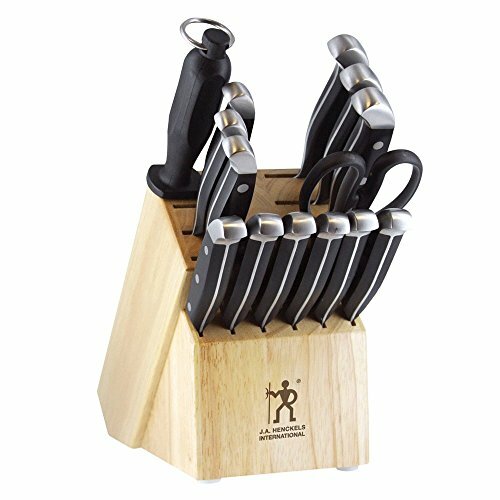 The HomeHero Stainless Steel Knife Set with Block is a set that you may want to consider. The HomeHero Stainless Steel Knife Set with Block promises to be an all-in-one cutlery set for every cook’s chopping needs. 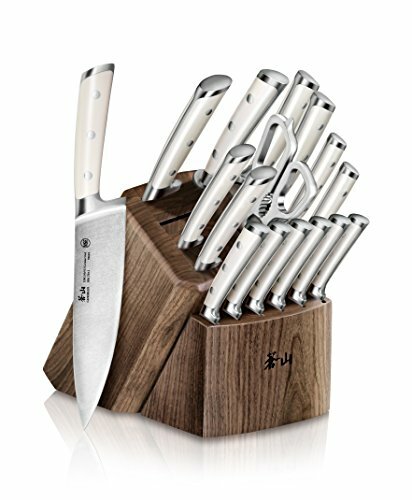 The set has 13 professional-quality knives that include a chef, bread, carving, utility, paring, cheese and pizza knives. 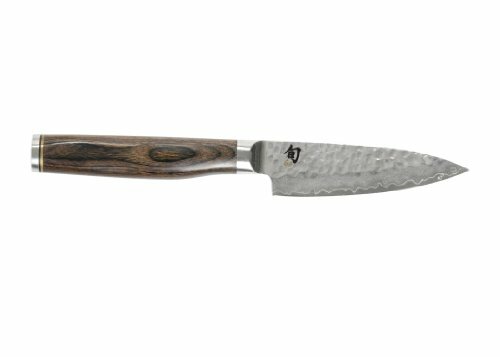 There are also six steak knives included that have fully serrated blades to increase their cutting efficiency. The knives’ blades are made from stainless steel. The product maker claims that each knife is designed efficiently for quick and easy cutting. For example, the pizza knife has a curved serrated blade while the chef knife also has a curved blade with a sharp edge. The bread knife has a serrated and scalloped design. The product maker claims that all the knives are rust-resistant. They also come with a colored non-stick coating. The handles also boast of an ergonomic design and TPR protective coating. Aside from the knives, this set has a dual set sharpener, a knife stand, scissors, and a peeler. The knife stand boasts of modern and clear design in acrylic plastic. The product maker offers a 100 percent money back guarantee. This means buyers who are unhappy with the product can ask for a full refund. The pizza cutter is poorly designed. The HomeHero Stainless Steel Knife Set with Block is all-in-one cutlery set to make the live’s of cooks easier. It is a 13-piece set that consists of different knives, scissors, peeler, and dual set sharpener. The blades are made from stainless steel that does not rust. The handles, on the other hand, are made from a plastic material that has a TPR protective covering and were designed to be ergonomic. The knife stand boasts of a modern design with its clear acrylic plastic material. Its product maker, HomeHero, promises a 100 percent satisfaction guarantee. Unfortunately, this knife set is without its flaws. For one, its protective covering tends to chip off quickly. The blades also need constant resharpening as they tend to become dull easily. The knife holder also has a major design flaw. It is bulky and will eat so much space in the kitchen counter. One must be careful with the holder as it can crack quickly given its plastic material. The knives also are difficult to remove from the holder as they cannot be pulled out from an angle. The HomeHero Stainless Steel Knife Set with Block has many competitors on the market. For example, the Elever 13 Piece Kitchen Knife Set is also an all-in-one knife set. It includes a chef, santoku, carving, bread, utility, and paring knife. It comes with four steak knives and a kitchen knife sharpener. This set by Elever does not have the pizza and cheese knives unlike the one by HomeHero. It also only has four steak knives, which is lesser than the HomeHero Set. The Elever knives set, however, has a santoku knife. The HomeHero Steel knife set has an additional free peeler which the Elever does not provide. Both products use quality stainless steel that is rust-resistant. The two products also can be washed in a dishwasher. The Elever blades, however, have a more detailed design with its 15-degree cutting edge angle. This is probably the reason why Elever set’s knife blades do not become dull over time easily. Unfortunately, the same cannot be said of the product we are reviewing. The two sets boast of ergonomic handles. The set under review is coated while the Elever knife set is not. The Elever’s knives’ handles also have a triple rivet, which the HomeHero product does not have. The triple rivet design allows for better grip and comfort. The Elever 13 Piece Kitchen Knife Set has a different holder. Unlike HomeHero’s plastic holder, the Elever product uses a wooden block, which makes it unlikely to crack easily. Both product makers also offer a 100 percent money back guarantee for unsatisfied buyers. HomeHero promises many great things with its 13-piece set. For one, the blades are made from high-quality stainless steel while the handles are ergonomic with a protective coating. The blades are also rust-resistant. The knife stand is unique with its use of clear acrylic plastic. The 100 percent satisfaction guarantee also makes the set attractive to buy. So, is the HomeHero Stainless Steel Knife Set with Block worth a buyer’s money? Unfortunately, the HomeHero’s knife set suffers from many flaws. The blades tend to become dull and the protective coating chip off easily. It also does not help that the knife block holder is poorly designed and its materials are prone to cracking. Overall, one might be better off finding a different product as HomeHero Stainless Steel Knife Set with Block suffers from many flaws while some of its competitors offer a better set. Knives have always been the go-to option when it comes to slicing meat, fruits, and vegetables. There is really no fault in this, but one needs to master handling that knife in order to make the task easier. But then again, what if we tell you that there is a substitute for a knife? Interesting, isn’t it? You see, not everyone can master the knife, but almost everyone can master the use of scissors. Think about all the times you struggled just to keep your slices even. Those problems will be gone (hopefully) thanks to the Jenaluca Herb Scissors. This kitchen scissors boldly claim that it can even replace a kitchen knife. Is there any truth to that claim? Let us find out! This product is actually a five-blade pair of kitchen shears. Yes, you read that right. This pair of kitchen shears has five blades, which is the reason why it is claiming that with just a single cut, it is already equivalent to 10 slices of a knife. However, it is actually not made to be used on cutting meat or other things. Although a lot of people claim to have been successful in cutting meat with this kitchen scissors, it is not really recommended to be used that way. Instead, it is great to be used for cutting herbs only so that they will not get bruised or torn. Definitely, this will be perfect for garnishes and herbs that need a thorough cutting. The blades are made of stainless steel, and the handles have a TPR interior so that it will be very comfortable to use. At the same time, it will help protect the handle against rusting as well as diminish the risk of slipping. 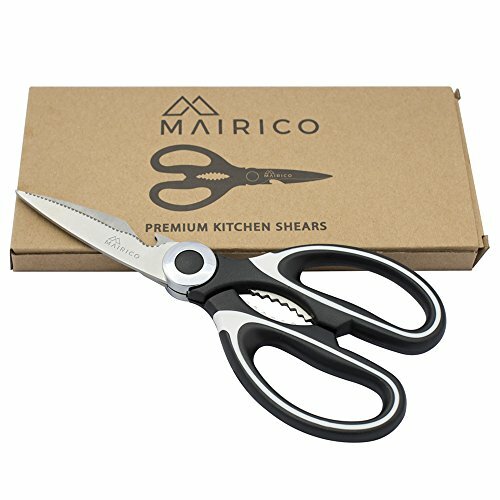 What is so great about this pair of kitchen shears is the fact that it also comes with a cover case so that the blades are protected when it is not in use. Not only that, but the cover case also has a comb that can directly sweep off the cut herbs and transfer it to a plate. Having that cover comb will minimize the mess of picking up such small pieces of herbs, which we all know can be pretty annoying. Then again, you might not even use the cover comb because the design of the blades was meant to be used to cut herbs directly on to your plate. No more messes, everything that will be left behind are perfectly cut herbs. The Jenaluca Herb Scissors has five blades that claim to be better at cutting herbs compared to a knife. The design is pretty nifty as you can finely cut almost any herb that you can think of. On the other hand, it is not recommended to be used for cutting other things like meat, but pieces of paper can also work as well. What is very interesting about it is that it can cut through whatever it is that you are cutting smoothly, and obviously, the final cuts are numerous compared to a knife. More than that, it comes with a cover case too. However good the mechanism and the design is, it still runs to some problems such as its tendency to clog and the fact that the herbs stick to the blades. The good thing, though, is that it came equipped with the tool that can combat these problems, which is the cover case. Let us now compare the Jenaluca Herb Scissors with the Joyoldelf Gourmet Herb Scissors. A quick look at the two scissors might confuse you because they look the same. They even have the same accent color, which is green. Not only that, but they also have the same number of blades, which is five. More surprising is the fact that they also have the same cover case and cover comb that has the same dual purpose. So, where do they differ, really? 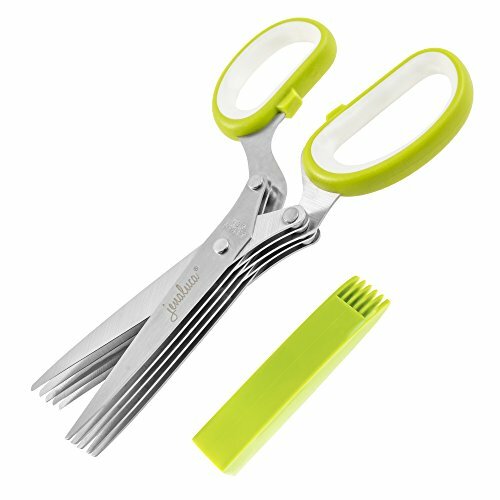 The Joyoldelf Gourmet Herb Scissors can actually be washed in a dishwasher. So, this points to the fact that its materials can withstand the extreme temperature inside the machine. At the same time, the herbs that were recently cut do not stick as much to the blade as compared to when you use the Jenaluca Herb Scissors. Now, those characteristics are what is lacking from the Jenaluca Herb Scissors. In fact, as we have mentioned before, its performance can somehow be overshadowed by the fact that the herbs are hard to pick away from the blades. More than that, the blades of the herb scissors from Joyoldelf might have a coating of some sort to prevent this from happening. Or maybe, the blade design is just better. With those in mind, which one is better? If you ask us, the Jenaluca Herb Scissors is still the one to check out. 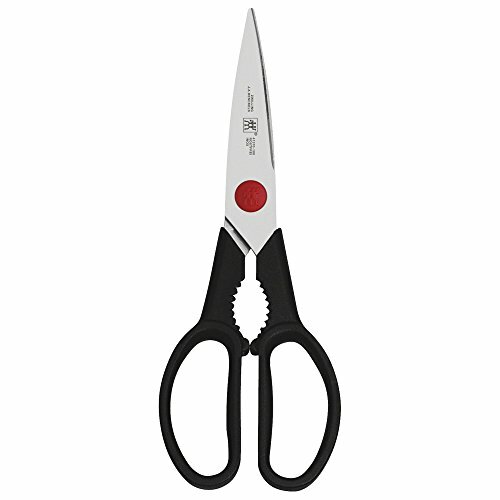 We chose this pair of herb scissors because of its effectiveness in cutting whatever it is that you want to cut. As for the one from Joyoldelf, there will be times when the herb will be torn or get bruised. In worst cases, it will even bend. So, where is the cutting in that? On the other hand, the one from Jenaluca can really fulfill its purpose everytime you use it. It is just unfortunate that, sometimes, the herbs get caught up in the blades. However, the good thing about this is that the solution is actually in your hands. Just use the case comb to wipe everything off, and you are good to go! The best kitchen shears can be hard to come by because no one can really judge its performance right off the bat. We are all too familiar with the time when our kitchen shears can’t even cut a piece of paper. The body also tends to flake off due to constant exposure to extreme temperature. So, how does one possibly find a pair of kitchen shears that will stand the test of time? Today, we are going to talk about three kitchen shears to help you decide which one is the best. In order to do so, we are going to take a look at their features as well as their pros and cons. Hopefully, by the end of this read, you would have found the perfect kitchen shears for you. Are you ready to meet our top picks? Then keep on reading! This pair of kitchen shears has a unique shape because its right handle is not really whole. The way that you use it is to set up the spring that is attached to the flat handle and attach it to the clip on the other handle that has a space for your fingers. Now, that might have sounded rather complicated, but it is actually very simple to set up. It was made that way to prevent any strains on your hands, and this design will also prevent any risk of slipping. This pair of shears was designed specifically to be used for cutting and trimming poultry, so just take your chances if it can withstand pressure against pork or beef. Moreover, it also has stainless steel blades, which are tapered and serrated so that you can have access to the areas that are harder to reach. These blades can also be separated for easy cleaning. Further, it should be hand washed with warm and soapy water. Let us now move on to the next kitchen shears. This time, we have a classic-looking one. By classic, we mean that it is the design that we are all thinking off when someone mentions kitchen shears. This pair of kitchen shears from Zwilling J.A. Henckels boasts polypropylene handles that are both whole. They each have an attached serrated curved blade that is used to open up or crack hard shells or bone. The blade is crafted from stainless steel that is of high-quality, which should be expected from the brand as it has been producing these types of products ever since 1731. At the same time, its blades can also be used on a lot of things from cutting food to opening packages, snipping herbs, etc. Furthermore, it comes with a built-in rotary so that it can loosen stiff lids. Lastly, this pair of kitchen shears is safe to be washed in the dishwasher. Nevertheless, handwashing is still recommended. The last kitchen shears that we are going to discuss features a unique blade design. If you can remember, the first product that we reviewed has an incomplete handle. This time, what we have is a pair of kitchen shears with an incomplete blade. Now, that does not necessarily mean that it does not perform well, though. In fact, it was made to be that way for optimum performance. One of the blades was designed that way so that it can easily do precise or detailed cuts such as butterflying poultry. These premium stainless steel blades have a lot of uses. It can cut food, open packages, and even be used for gardening. Furthermore, these shears claim that every cut will always go through smoothly. Just like the previous kitchen shears that we talked about, this one also has the typical handle design, which features the serrated blade on either side. This serrated blade can crack nuts, open bottles, and more. Aside from all of that, it was also coated with a film that prevents it from rust and corrosion. The design of the handles was made for it to be resistant to slipping and to not strain your hand if you are using it for long periods. Lastly, like the other kitchen shears, this one was also made to be dishwasher-safe, but, again, it is best to wash it by hand. In all honesty, all of the products that we discussed can easily be branded as the best one. All of them can cut well, and they can also maintain their initial condition for a long time. Do keep in mind, however, that even though you have the best kitchen shears, it is normal for it to rust and corrode. This is especially true if it is always wet. Of course, know that bacteria tend to live on these things too. So, really, you cannot escape the wrath of the rusting. You just have to accept that even with proper care and maintenance, your kitchen shears will eventually dull and develop rust. Now, if we are to choose just one product, we will go with the one from MAIRICO. We chose this one because it is very versatile, and it has enough safeguards to somehow withstand the dulling of the blade and the development of rust. Also, its blades feature, which makes it easier to cut through hard-to-reach areas, is definitely a win. Vegetables are common ingredients in every home kitchen since it can either be a main dish or a garnish. That is why you need an efficient tool to prepare your vegetables properly. A vegetable chopper is a highly useful thing to have in your kitchen, especially since every day you need to peel and chop vegetables which can be a time-consuming chore. There are two types namely manual and electric. Electric choppers are expensive and not that great for chopping or slicing vegetables. On the other hand, manual choppers are inexpensive and portable, making them a more practical choice. Manual choppers are created with different chopping mechanisms, but they all have sharp blades. In just minutes or even seconds, you can chop vegetables for your salads, salsas, purees, and other recipes. You can at least chop a cup or two at a time. If you are looking for a manual vegetable chopper, the Bellemain Vegetable Chopper Pro is one of the most popular options today. Let’s find out if it’s a worthy investment or not. The Bellemain Vegetable Chopper Pro is a heavy-duty product that is designed for vegetables and fruits. From the hard ones to the soft ones, you can chop any fruit or vegetable in a matter of minutes. The Bellemain Vegetable Chopper Pro is a manual chopper with parts that can be washed in a dishwasher rack safely, making it incredibly convenient to clean and work with. 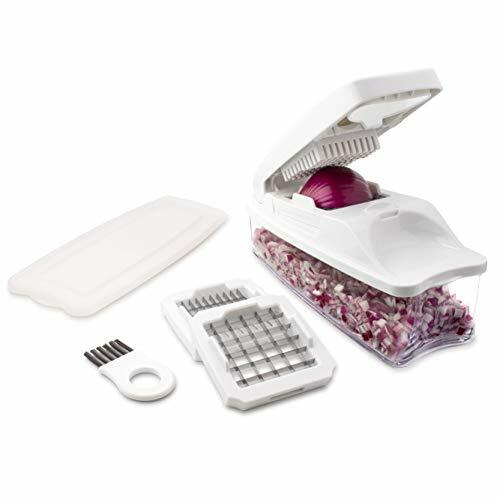 What is better is that the unit comes with a cleaning brush to help you get rid of all the leftovers on the blade and hinge before washing it. Its container is made from BPA-free plastic, which indicates that no harmful chemicals are risking the produce you use in this chopper. It has a capacity of up to four cups, so you can make a full bowl of salad at once. Bellemain also claims that this chopper can cut your vegetable prep time by 50%. The most important part of the chopper, whether electric or manual, is the blade. That being said, this product is equipped with German-made, high-quality, stainless-steel blades. They will not rust or lose their sharpness over time and will keep performing as they do the first time for years to come. Additionally, the chopper comes with three interchangeable inserts namely ½ inch dice, ¼ inch dice, and ¼ inch julienne. The chopper uses a press-down mechanism wherein you just press the upper lid on to the blade disc, and then the vegetable effortlessly passes through the blade disc and is diced. The teeth on the lid, which is made to match the exact holes of the blade help push the vegetable easily. It also gives it a more even cut. Since the container is closed, there are no tears when dicing onions, making it perfect for chopping onions which can be a frustrating part of cooking. After using, if you want to store the vegetables, you can use the chopper as a container. The airtight lid closes firmly and keeps the freshness of the vegetables intact. The Bellemain Vegetable Chopper Pro comes with a two-year warranty. If it breaks or does not deliver the right performance, you can have it changed. This vegetable chopper from Bellemain is a simple but efficient product. It can dice your vegetables and fruits in three different sizes, and it produces great cuts of onions. Both the container and the blades have been constructed with BPA-free materials. The blades are super sharp and long-lasting. On the other hand, the plastic container has a generous volume, making it perfect for making quick salads and salsas. However, you may not be able to use it efficiently in a restaurant or industrial kitchen because the capacity is just enough for home use. This product doubles as a container since it has a solid lid. Additionally, cleaning and washing it is not much of a hassle because you can just place it in the dishwasher after removing all the dirt with the help of the provided brush. In order to really understand what makes this vegetable chopper stand out, we have to compare it with another manual vegetable chopper, which is the Brieftons Manual Food Chopper. In terms of quality, they are both the same—sharp blades, BPA-free plastic, and airtight lids. There is also no significant price difference either. It does exactly what the Bellemain Vegetable Chopper Pro does except for the fact that it does not dice ingredients evenly. That is because this chopper has a different chopping mechanism. It is essentially a bowl with a cord-pull system attached to the blade. As you pull the string, the blade rotates and chops the veggies arbitrarily. The Brieftons Manual Food Chopper is also available in two sizes, namely the two-cup and four-cup. Likewise, this chopper may just be used for salads as well as dishes wherein vegetables just need to be mixed in. On the other hand, the Bellemain Vegetable Chopper Pro can be used for cutting vegetables for salads, viands, soups, and side dishes. That said, both these choppers are backed by a money-back guarantee, making them a safe purchase. If you are looking for a manual vegetable chopper that is efficient, durable, and convenient, then the Bellemain Vegetable Chopper Pro should be your choice. It is on point in terms of performance thanks to its suitable chopping mechanism and sharp blades. It is a good investment; one that will save a lot of your time in the kitchen when cooking vegetables. The company also backs it with a warranty, and whatever it is that you need to be diced or julienne cut, you can use this manual chopper. Also, since it is small and lightweight, you can even take it on picnics. Overall, this is highly recommended because of its great value for money.